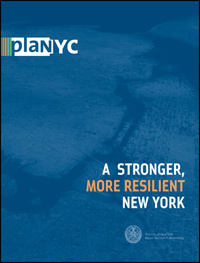 On June 11, Mayor Michael Bloomberg announced “A Stronger, More Resilient New York”, a comprehensive plan that contains actionable recommendations both for rebuilding the communities impacted by Sandy and increasing the resilience of infrastructure and buildings citywide. If you would like a hard copy of the report, it is available for purchase by accessing the CityStore website. You can also download the report for free below. Due to the size of this report, several options are available for those who wish to print the report, including both single pages and two-page spreads. Single pages print best on Letter-sized paper, while two-page spreads print best on Ledger-sized paper. High-resolution versions of individual chapters are available as single-page PDFs by clicking on the links below.